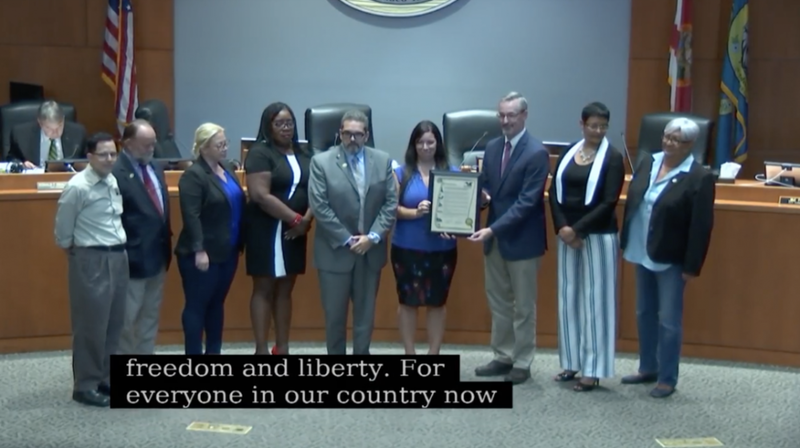 Kissimmee, FL – The Freedom From Religion Foundation’s (FFRF) chapter, the Central Florida Freethought Community (CFFC), the ACLU of Florida and its Central Chapter are to be honored by proclamation at Tuesday’s City of Kissimmee Commission Meeting at 6 PM Tuesday (101 Church St, Kissimmee, FL 34741). This is in response to complaints from the organizations that prompted the city to revise its prayer proclamation last month. The groups will also conduct a presentation for the Commission on the importance of the Establishment Clause and the separation between state and church. In August, the city proclaimed “40 days of celebration of life, love and family” and announced a call to prayer event for August 21. The proclamation, the ceremony at the Commission Meeting, and the photos released for the event had the appearance of city sponsorship and endorsement. After complaints were received, the city said it was not their intention and that the “city officials’ actions and comments were interpreted as promoting a religious message and advancing religion over nonreligion.” The city also properly distanced itself from the prayer event in a city-owned park, saying that it is not a sponsor and has not used city resources to promote one religion over another.